On occasion, we get ammunition in that the boxes just don't meet our standard of quality. The rounds are perfectly fine, but we just don't like shipping out torn up or crushed boxes (maybe we're too obsessed with being perfectionists). We take the ammo out of those boxes and repackage them in loose pack sealed plastic bags and offer them for sale to you at a reduced price. While you won't know the brand or projectile type/weight when you buy the rounds, you will know you're getting a great deal. This lot contains 100 rounds of .22 Short ammunition. 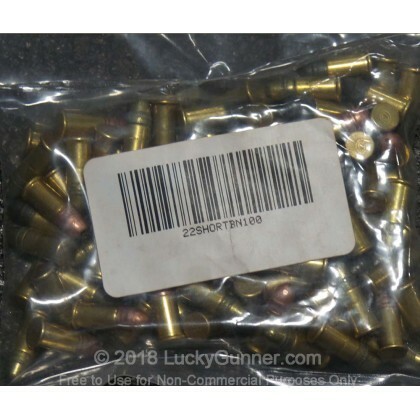 These cartridges have brass or nickel-plated brass cases with rimfire primers. The bullets may be solid or hollow point, and muzzle velocities may vary somewhat. If you're looking for ammo to pop a couple of cans and bottles with, these rounds are a great option. We don't have any reviews yet for this particular .22 Short ammo from Mixed. If you'd like to be the first to review this particular .22 Short ammo from Mixed, fill out the form below.